Was the Giants Head Marathon actually a marathon or an ultra in disguise? I don’t know about you but one thing that amuses a lot of seasoned runners is when they tell someone they’ve just run a marathon and the person replies with ‘Wow, how far was it?’. A few weeks back I took part in the Three Forts Challenge. This has been cunningly named so as not to mention the word ‘marathon’, although locals still call it the Three Forts Marathon. 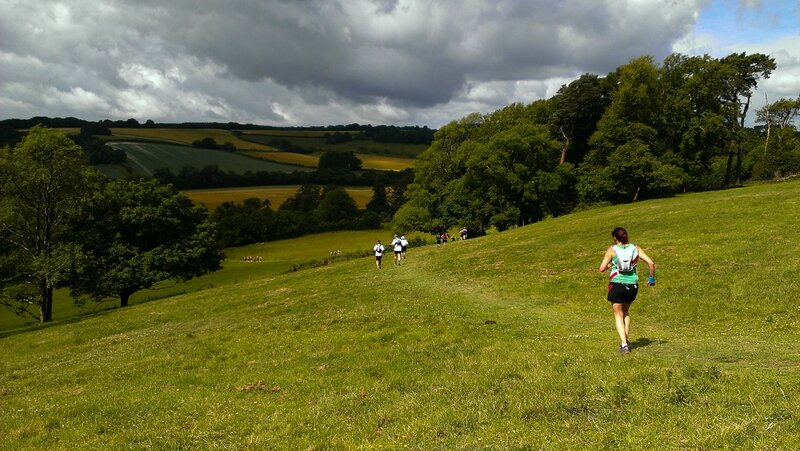 It is a 27 mile trail race over the South Downs. The Giants Head Marathon is also 27 miles. However, it doesn’t shy away from the ‘marathon’ moniker and even claims to be’one of the longest marathons in the UK’. So next time, when some poorly educated non running luddite asks you how long your recent marathon was, don’t be so quick to mock, because even amongst experienced event organisers there are varying opinions. 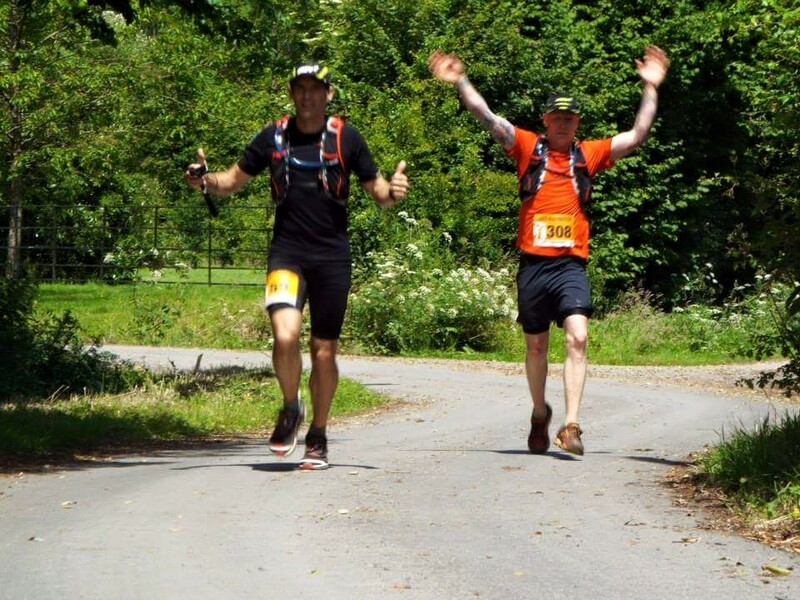 Technically an ultra is any race further than the 26.2 mile marathon distance. But many argue that you can’t call a race an ultra until you hit 50k or 31 miles. So what do you call those races which fall in between 26.2 and 31 miles? Do you know what? I don’t care and neither should you. Let’s just get on with running shall we? Luckily for me, my mother-in-law lives some 10 minutes drive from the little village of Sydling St. Nicholas where the Giants Head Marathon starts. So accommodation was no problem. My running buddies, Richard and Sharla had to book hotels and make a long weekend of it. Not that they were complaining. We woke to bright blue skies on Saturday morning and left for Sidling St. Nicholas just after 7am. Race start was at 8:30 so we had plenty of time to take in the atmosphere, register, use the facilities and film anything and everything! Race admin was set up in the village hall. There was proper coffee for 50p and even porridge on offer. Even at 7:30 it was warm in the sunshine. Andy Palmers race briefing was notable for the inclusion of the longest, most nail-biting marriage proposal I have ever witnessed. Thank God she said yes. Andy also pointed out an incredibly tall lady standing behind a bush and then, before we all ran for our lives, revealed she was in fact a normal sized lady on a horse. In her hand was a huge hunting horn which would be used to start the race. This, ladies and gentlemen, is trail running in deepest Dorset. 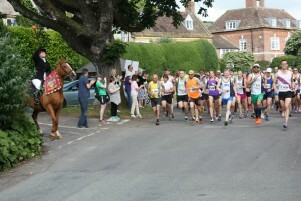 It wasn’t long before we were all lined up in the main road through the village ready to start. One practice blow of the horn, followed by the real thing and away we went. The first 400m were on the road and were flat. Then we turned left and within a kilometre of the start we were climbing our first hill and I was walking. As usual, Richard had gone off like a crazy guy and I soon lost sight of him. After the first hill there was a good 4km of flat running, during which time I could hear a bell clanging. I obviously believed it to be a church bell but as I approached I was reminded of something I had read in one of the pre-race emails. Sure enough the bell was being rung by a farmer shouting words of encouragement to us (at least I think that’s what they were) as we passed. Somewhat disconcertingly however, he was completely naked, his modesty preserved only by the height of the foliage between us. It was enough to send the most hardy soul off running faster. As with all hilly trail marathons my plan was to walk up all the hills to preserve energy. And as usual I was carrying my GoPro camera with me. Filming the run does two things. Firstly it can sap your energy more because of its weight and the concentration needed to hold it steady. But it can also take your mind off the kilometres. You’re interviewing someone and filming the scenery and all of a sudden 3km has gone by without you noticing. Early on I met Alex who was on his 11th marathon and Matt who was doing his first trail marathon but is an experienced Iron Man competitor. 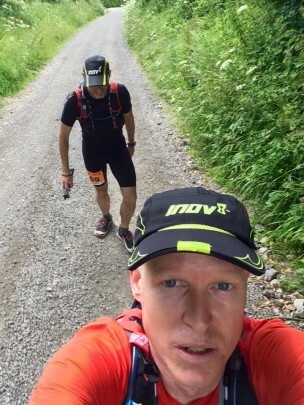 I was delighted to discover that many of the aid stations had Coke, which is fantastic to drink on trail marathons. I wouldn’t go overboard on it but it certainly gives you a quick burst of glycogen and replaces some lost electrolytes. Not so good on fast road marathons though! You don’t want gas in your stomach if you’re running at pace. Some of the scenery at the top of the inclines was stunning and there were some superb downhill gallops through corn fields. The elevation on the Giants Head marathon is pretty impressive. 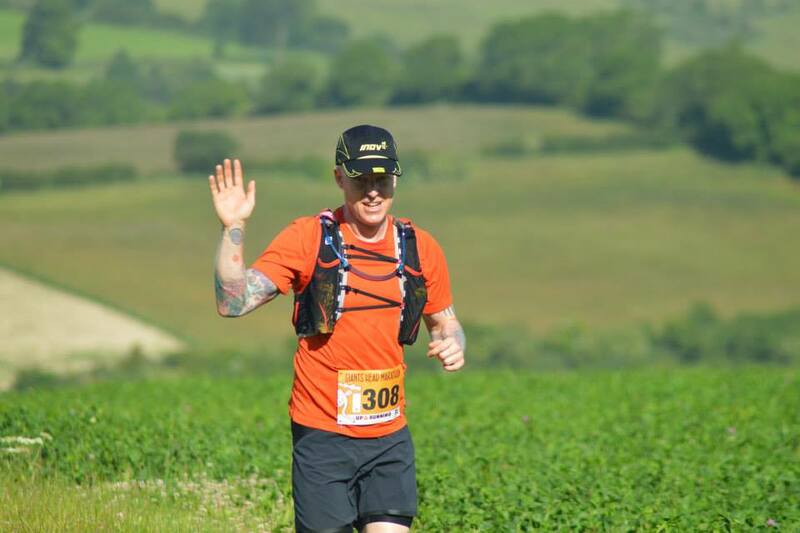 It is comparable to the Beachy Head, Three Forts and Steyning Stinger marathons, all of which are pretty tough. All three races have between 900 and 1100 metres of elevation or around 3400ft. However, the Giants Head Marathon has 9 major climbs to the Three Forts 4. Beachy Head has numerous climbs but they are all smaller than those in Giants Head. 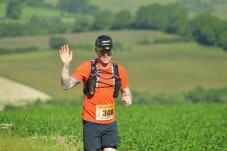 I had a bit of a nightmare in the Beachy Head marathon, so for me, that remains the toughest marathon I have ever done. But technically, Giants Head is tougher. It really was warm but I’d rather deal with the heat than have the scenery spoiled by clouds and rain. I don’t mind running in inclement weather but given the choice I’d have the sun every time. One minor gripe about the Giants Head Marathon is that the actual view of the Giant, the white chalk man with a huge erect appendage carved into the side of a hill, is not that great. So much so that I didn’t bother filming it. I had hoped we would run right across it, but it was not to be. I chatted to a couple more people en route. John was running his 5th marathon. His first was the Giants Head inaugural event two years ago. David runs for Maiden Newton Runners, a local club and knows my wife’s friend Emma. He’s on his 11th marathon. When I asked him why he runs he told me he just loves being out in the countryside. Here’s to that David. 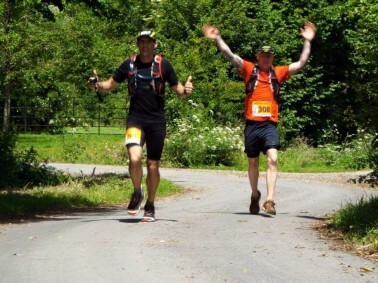 As I approached the 20 mile mark I wondered if Richard might have tired and whether I would catch him up. Sure enough, I arrived at the aid station and he was there waiting for me. The aid station at 20 miles was called the Lovestation. So named because Joanne and Jason, the couple who got engaged at the start of the marathon, had left champagne and strawberries there for everyone. I didn’t have any but what a nice gesture. Richard and I spent a little too long at that and subsequent aid stations. To be honest it was mainly me! Richard was itching to get going and there’s me gulping down another coke and chomping another piece of water melon! We stayed together for the final 7 miles, which were pretty tough. There was a really nasty section of flint path which we had to negotiate and a couple of good climbs too. Thankfully there were plenty of aid stations. There was even one at the 41km mark. Only 2km to go and there is an aid station. Fantastic. 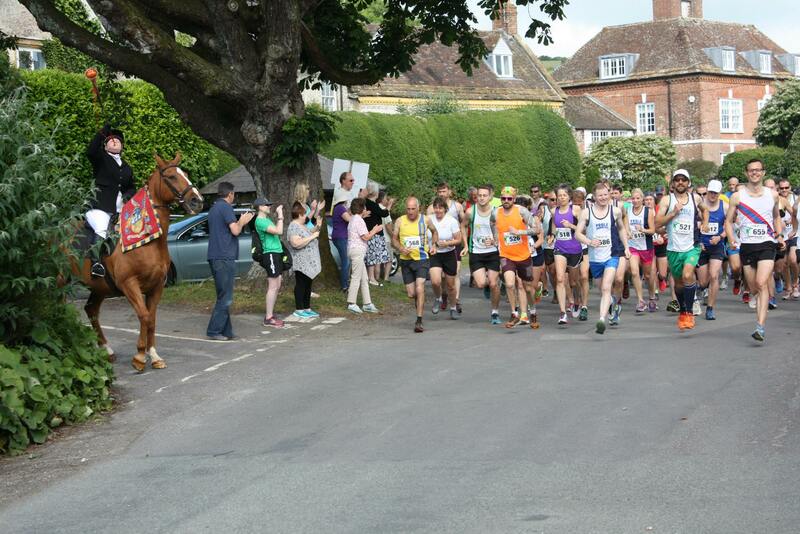 The final kilometre of the Giants Head Marathon is a steep downhill run back in to the village at Sidling. The finish line was on the village green. There were plenty of people there to cheer us in and it was a really nice atmosphere to come back to. Richard and I finished in 4 hours 32 minutes. We had planned on under 4:30 but spending too long at the aid stations and slightly misjudging how far we had to go at the end cost us those two minutes. Not that we were that bothered! Emma Elliot finished in 5:32 and Sharla Elder in 5:49. In a brilliant feat of organisation, White Star Running managed to get portable hot showers for us to use at the end of the race. Fortunately for me, when I got to them I walked straight in to one. When we came back after eating at the Greyhound Pub, there was a huge queue. That’s one of the benefits of running these things that little bit faster. Another benefit is the stock at the aid stations. Having watched a couple of other peoples films of the race, some of the aid stations looked rather bereft of stock when the 5 and 6 hour runners made it to them. If you can steal yourself to run a trail marathon in between 3 and 5 hours you’ll find very tidy, well stocked aid stations! I am very lucky to have run some fantastic marathons in the past 2 years and this has to rank up there with the most enjoyable. The weather, the company, the location and the organisation all made for a great experience and if I am able to I will certainly run it again. The Giants Head marathon is highly recommended and is certainly one to add to your bucket list of UK races. 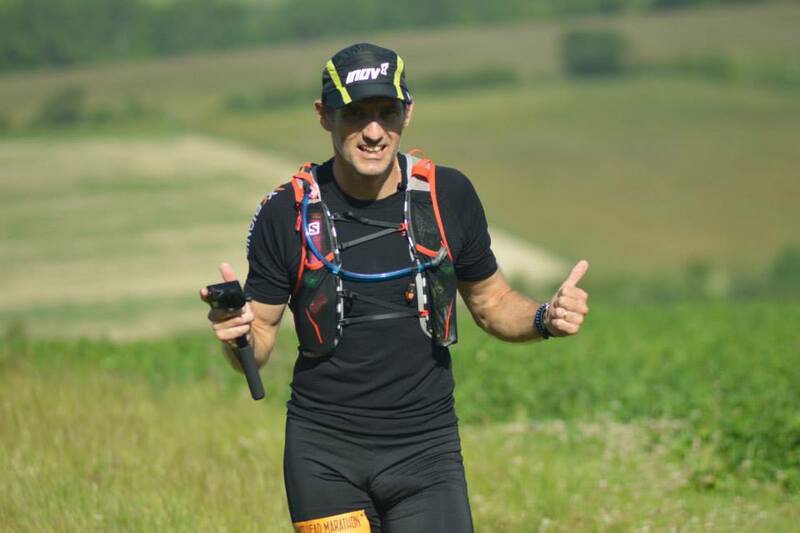 Just make sure you also do Beachy Head, Steyning Stinger, Three Forts Challenge and the Purbeck Marathon so you can compare how tough they all are! 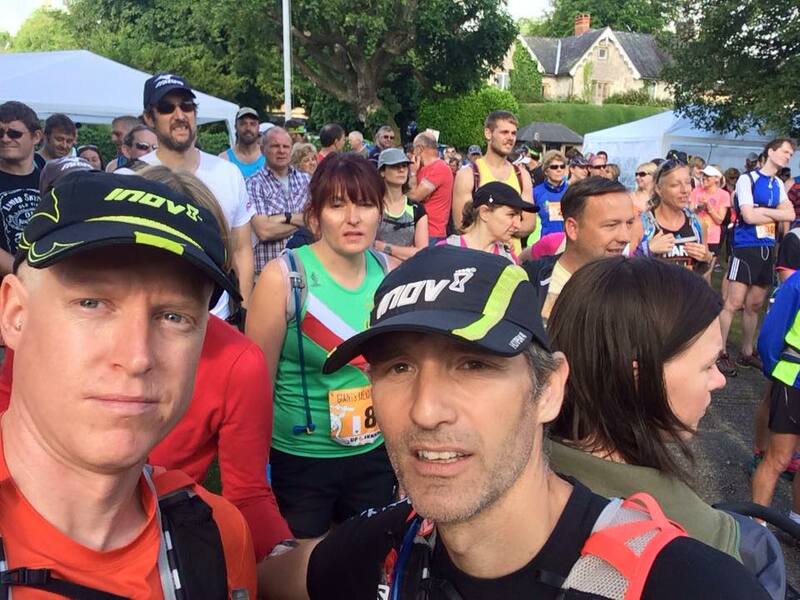 If you have found this Giants Head Marathon race report and video useful and interesting, or if you or someone you know is planning to do the race next year, please do share it and give it a Google +1 or a Facebook like. Big thanks must go the Andy Palmer and the staff at White Star Running, all the volunteers, marshals and supporters. Well done to all on making it a great day out.